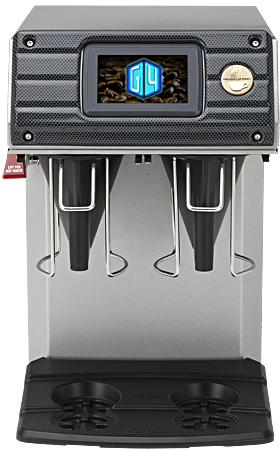 If the Curtis G4 CGC Single Cup had expressive eyes and was on a wheel base it would look a lot like a coffee making co-worker of Wall-E. Smart technology goes from your added gourmet grinds to cup in no time flat. Skip paper pods and plastic coffee capsules and still get one cup convenience with real coffee from the Curtis G4 CGC. G4 Touch screen: Easy icons for one touch coffee and USB port for updates and recipe sharing. In Hot Water: Dedicated hot water faucet for making teas. Reduce Waste: No need brew up a whole pot of decaf or have to pour out unused carafes with a single cup solution.